Vang Vieng; the little town in Laos infamous for the reputation it developed in the 90’s as the hedonistic, party capital of Southeast Asia. 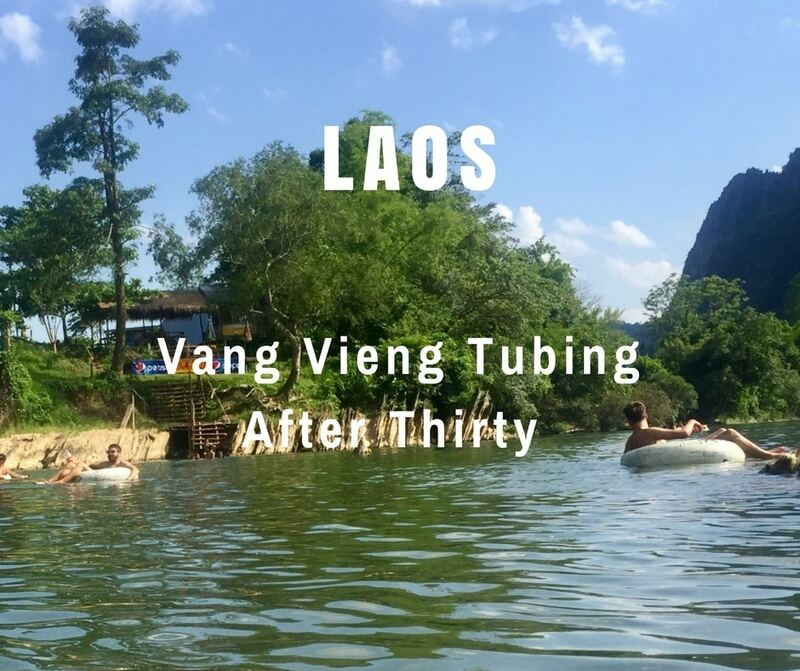 Young backpackers would swarm there for their backpackers ‘rite of passage’ – Vang Vieng tubing on the Nam Song River. The aim for most was to get completely off their faces on booze and drugs at the 30+ riverbank bars. They’d then throw themselves off rope swings and platforms, or down a ‘death slide’ into the river. Inevitably, this didn’t end well. As the number of visitors increased so did the number of fatalities. Alcohol, drugs, drowning, and jumping onto rocks in shallow water, were all to blame. In 2011 it had turned into a death trap, with a death toll reaching 27. In 2012 the Lao Government decided enough was enough and intervened. They shut down the tubing in Vang Vieng; the parties stopped, the riverside bars were ripped down, and the backpackers left town. The town became deserted, and the local economy took a hit. It was a huge worry for the locals who had relied on the business the tubing scene had generated. About a year later the Government allowed the tubing to resume, albeit on a much smaller scale. They enforced much stricter rules and regulations; permitting only two or three riverside bars to open at any one time. As a result, the tubing and partying still happen today, only on a much smaller, more sensible scale. Nowadays Vang Vieng is building itself a new reputation as an outdoor activity and eco-tourism destination. This focuses on its spectacular, stunning scenery and surroundings. I’d been hesitant about visiting Vang Vieng but having heard great things about the ‘new’ Vang Vieng, I decided to give it a go before heading up to Luang Prabang. Curiosity had also gotten the better of me and I wanted to see for myself what the tubing scene of today was about. I’ve never been one to turn down an adventure, or a party (within reason), so couldn’t resist. I felt apprehensive and nervous as our mini-bus arrived in Vang Vieng after a bumpy 3.5-hour journey from Vientiane. Whilst things may have calmed down in Vang Vieng, there’s still an element of partying (for those who want it). I was hoping I wouldn’t be out of my depth, especially as I was travelling solo this time en-route to the Mekong Tourism Forum 2017 in Luang Prabang. You have to collect and pay for a tube from one of the tubing shops in town. There are white or yellow tubes which are locally owned, and newer red ones which are privately owned. I went to the first shop I came across, at the end of the road I was staying on. There was a Songthaew (Lao tuk tuk) parked outside with about 20 people milling around. To be honest, it all looked a bit chaotic; I took a deep breath and headed in. Five minutes later I’d signed a waiver form and paid 55,000 kip (£5.16 GBP), plus a 60,000 kip deposit (in case I lost the tube or returned it after 6:30 pm). Before I knew it my well-worn, white painted tube had been bungee strapped to the roof of the Songthaew with several others. Next thing I found myself crammed into the back of the Songthaew with a group of young backpackers. Looking around I thought “What on earth have I gotten myself into”! Everyone else was barefoot in bikinis or swim shorts, clutching plastic bottles of spirits and mixers. I, on the other hand, was wearing walking sandals, shorts and top (over a bikini), and was clutching a mouldy life-jacket. Despite being the wrong side of thirty, I often feel (and sometimes act) as if I’m still in my twenties. However, right then, surrounded by those excited and slightly tipsy younguns I definitely felt my age. 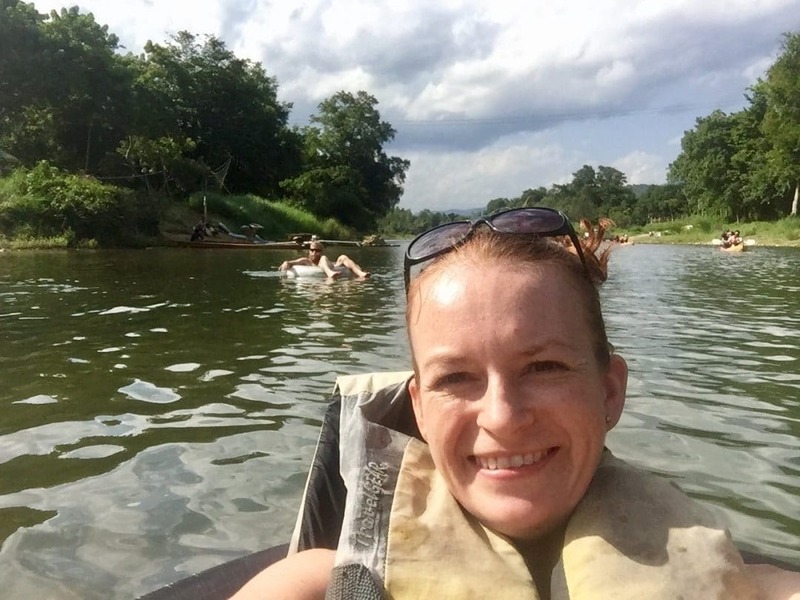 I began to have second thoughts about my fast approaching Vang Vieng tubing experience. The Songthaew rumbled along potholed roads for about 10 – 15 minutes until it reached our start point. It turned out that the young backpackers I’d found myself with were actually a nice bunch. They seemed more than happy for me to tag along and share their pre-drinks, whilst good-naturedly (I think) teasing me about my life-jacket. I laughed and said “it’s ‘the fear’…it comes with age. I’d rather look stupid than drown”. The tubes were passed down to us from the roof and we carried them down to the river. The others chucked theirs into the shallow water and jumped onto them. They pushed themselves out into the slow current and started to float away from me. Eager not to get left behind, I inelegantly manoeuvred myself into my tube getting completely soaked in the process. I must say I felt a little smug that I’d had the foresight to bring my dry bag with me for my phone and cash. I pushed myself through the shallow water into the current, scraping my bum on the rocks as I went; then I started to float slowly downstream. After a little more than a minute of floating, I spotted the first bar. Knee deep in water were young local boys throwing filled water bottles tied to a piece of rope out to the tubers to catch. They were literally fishing for tubers and reeling them into the bar. Soon it was my turn. SPLASH…the first bottle launched at me landed miles away. SPLASH…again the second bottle landed out of arms reach, I paddled frantically towards it but to no avail. By that point, I’d floated past the bar and resigned myself to the fact I was likely to miss it completely and lose my new found friends in the process. One of the young boys yelled at me and I saw a third bottle hurtle towards me. This time after some frantic thrashing about I managed to grab it and laid back as he hauled me to the riverbank. As I walked up the steps a male bartender in a dress welcomed me to the bar with a shot of the local whisky, Lao Lao, which of course, I accepted. There were about 30 to 40 people in the bar, in various stages of undress and drunkenness, nothing too bad though. I bought a large beer at the bar for 20,000 kip (£1.88 GBP), double the price in town. Scanning the room I spotted the others playing a game of beer pong and decided to join them. When in Rome and all that! We stayed in that bar for about 45 minutes then it was back in the tube and floating down the river again. It was only about 15 minutes until we reached the second (and last) bar. This time we didn’t need to be ‘fished’ for as the current dumped us on the rocks near the riverbank. This bar was smaller, busier and the clientele drunker. Music pumped out whilst people lounged on platforms chatting, danced (badly), or played mud volleyball next to the bar. We’d been there about 20 minutes and sunk another beer when the bar staff announced it was time for a game. It turned out to be a drinking game with everyone sitting in a circle throwing water balloons to each other. If you dropped it and burst, you got wet, were out of the game and had to down a shot of Lao Lao. It was all a bit of harmless fun and I’m sure a far cry from the debauchery that went on in the old days! It was starting to get late so we relocated our tubes and set back off down the river. A bit deeper and the current stronger this time meant I soon lost sight of my new friends. I was secretly pleased I’d lost the others. It gave me chance to lie back, relax, and soak up the incredible scenery of the limestone karst mountains looming over the river. it was also pretty peaceful. and I would have dozed off if it wasn’t for the occasional group of smiling kayaking Koreans…laughing as they splashed me with their oars! After about an hour it was time for my Vang Vieng Tubing experience to end. I dragged my tube out of the river onto a waiting Songthaew, which returned me and some others to town for 10,000 kip each (£0.94 GBP). Back at my hotel that evening I actually felt quite pleased that despite my hesitancy and nerves I’d pushed myself out of my comfort zone. I’d met a great bunch of people and had a fun-filled afternoon! The only downside was that my dry bag turned out to not be quite so dry – so much for feeling smug earlier in the day. Water had gotten in and rendered the front-facing camera useless. Moral of the story is…don’t take your phone or camera tubing! If you really must take them, be sure to buy a proper dry bag from town beforehand! I’ve since bought this great waterproof case for my iPhone which works perfectly. 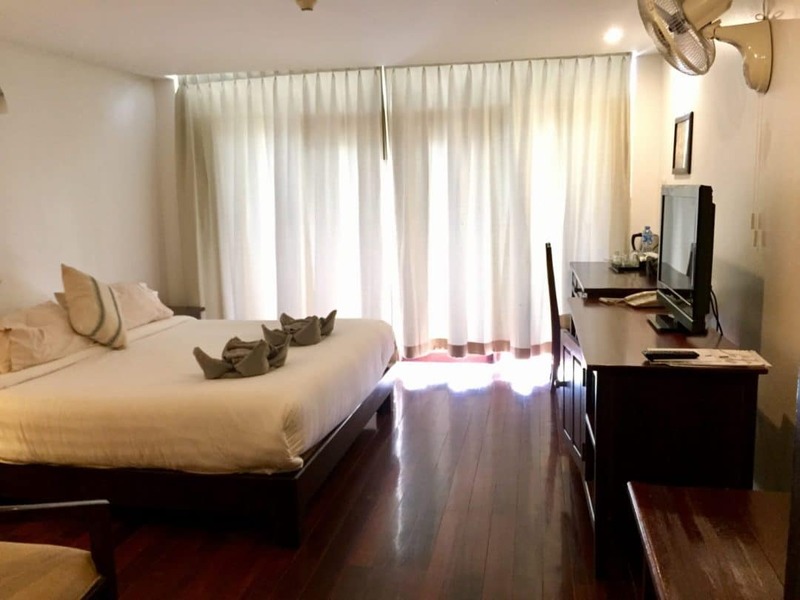 I was hosted for my two nights in Vang Vieng at Silver Naga Hotel, which I’ve reviewed below, along with another couple of accommodation suggestions for different budgets. Read our full Product Review Disclosure here. Silver Naga is named after the water serpent from Laos mythology. It’s believed to protect the land and rivers of Laos. 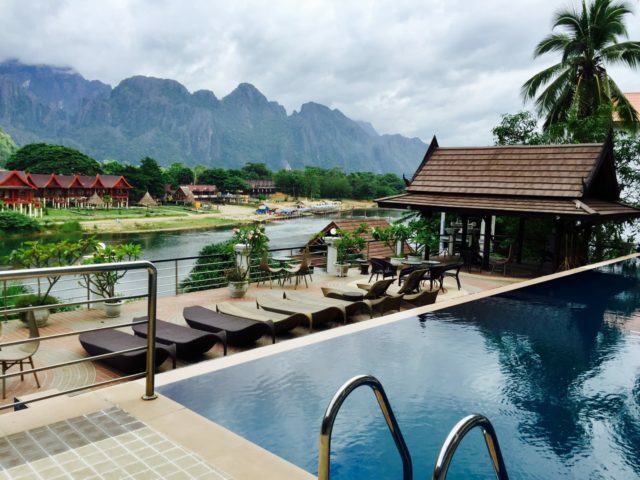 A luxury, boutique hotel, Silver Naga has an excellent location just five-minute walk from the centre of Vang Vieng. It’s set right on the banks of the Nam Song River with the most amazing view of the karsts. The hotel has a strong focus on ethical tourism and makes is passionate about looking after their staff, the environment, and the local economy. A range of rooms are available, start from $65 (£50.45 GBP) for a double or twin standard room. They go up to $180 (£139.70) for a family suite which sleeps up to four people. I was greeted by friendly reception staff with a cold towel and a welcome drink, whilst they shared information with me about the hotel. 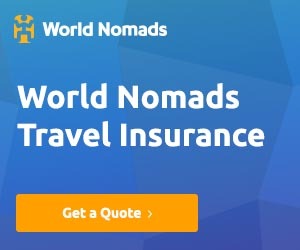 They were also more than happy to answer my questions about tubing and helped me arrange my onward travel to Luang Prabang. I was all checked in and shown to my room within ten minutes. I had a deluxe double, with shower, aircon, television, minibar and coffee and tea making facilities. The room was clean with a comfy double bed and complimentary toiletries in the bathroom. My favourite part was that it had its own terrace with chairs. It overlooked the swimming pool and offered breathtaking views out over the Nam Song River and the hulking karsts. The infinity pool on the sundeck of the hotel was the perfect spot to relax and admire the views after my second day out cycling and hiking. There’s also a pool bar where you can order drinks and snacks and a shaded corner with tempting hammocks. Unfortunately, I didn’t get a chance to eat lunch or dinner in the restaurant. However, the breakfast buffet was huge spread with a wide variety of Western and Asian options, along with fresh fruit, tea, coffee, and juices. There was reasonable wifi throughout the hotel, including in my room. Other facilities on offer which I didn’t get a chance to enjoy were a small gym and a twice daily yoga class. If you’re on a budget or looking for something slightly different there are plenty of other accommodation options in town. There’s something for everyone. Was Vang Vieng Tubing Worth It? Before visiting Laos, I’d been quite hesitant and undecided about visiting Vang Vieng. Travelling solo, without friends or husband, I’d expected (correctly so) that I would be one of the oldest people tubing, despite this, I actually had a great day. It’s far from the crazy party it once was, although a few people were still trying to live up to that reputation. Although not a pre-requisite there are still illegal substances and plentiful alcohol available upon request should you wish to indulge. Yet, floating along the river taking in the beautiful backdrop of limestone karsts is a great experience in itself. If tubings not for you (remember you can bypass the bars if they’re not your thing) you can also hire out a kayak or a boat with a driver. Or there are plenty of other outdoorsy activities such as hiking, cycling, and quad biking you can partake in. 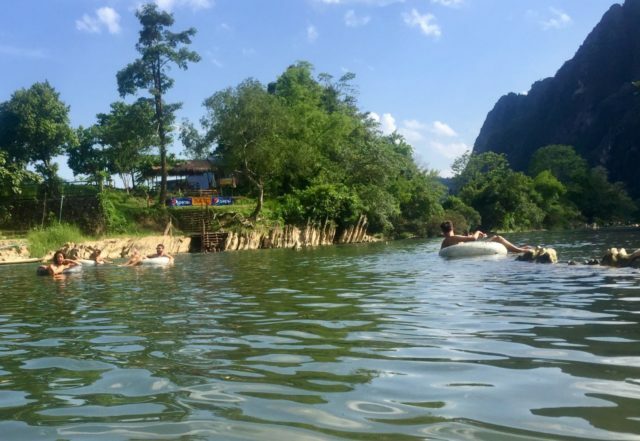 Have you been tubing in Vang Vieng recently? How was your experience? Product Review Disclosure: Silver Naga Hotel provided me with a complimentary two-night stay. This did not influence my post in any way and as always I’ve provided a balanced and honest review. 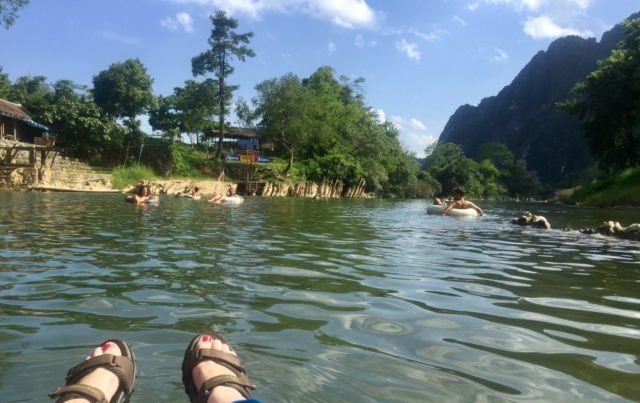 It’s really interesting to read about what Vang Vieng is like now, as I went right after the crack down and was one of about 5 people tubing down the river. There was maybe one bar still in business. I’m glad to see that the whole tubing scene has developed more responsibly/sustainably this time and people are focusing more on the natural beauty of the place. Goodness yes that does sound as if it was quiet then! I think things have definitely changed for the better! Mine too – but to be honest it’s really quite shallow and it’s highly unlikely you’d drown with a life jacket on! I first tried tubing in one of the provinces in the Philippines. Super enjoyed it! This looks fun as well. That sounds good, I haven’t been to the Philipines yet but hopefully will one day. I had never heard of tubing before I read about it on your post. Though I would not prefer the bars, I would definitely try it for the amazing views and experience of floating on the river. “Despite being the wrong side of thirty, I often feel (and sometimes act) as if I’m still in my twenties. However, right then surrounded by those excited and slightly tipsy younguns I definitely felt my age”- Exactly how I felt doing a similar trail in Thailand called the #TheBeachTrail2017. But nice to see people feeling similar to me. Good One! Sailing along the river in the tubing, those scenic views and bars along the river are quite adventurous. Today only I was scrolling about Vang Vieng and now got through this article. Wow! We surely want to hit this place in future and experience this. Your hotel too looks nice. I’d definitely recommend it for a visit, but if you have time try to explore by kayak too and hiking or biking in the surrounding area! Enjoy! Never been to Vang Vieng! Bars are not for me rather I am not for bars  But the scenic sights are mesmerizing. Definitely worth sailing the river. It’s definitely worth a visit if just for the scenery; kayaking would also be a wonderful thing to do on the Nam Song River! 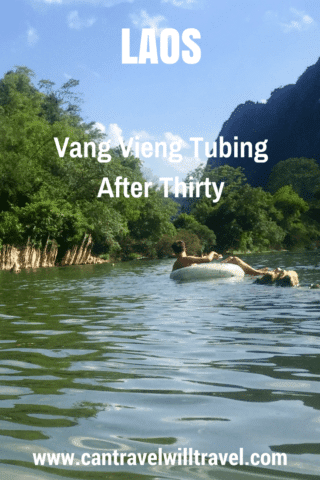 The history of Vang Vieng tubing is so sad. It is good that the authorities woke up and took drastic action. Also quite heartening to note that a new revitalized and safer tubing is now available. The water bottle and being hauled to the bar is an incredible experience, I daresay. Yes I agree, but at least now things are changing for the better. Although a dare say back in the day before it got too crazy it was great fun and an off the beaten track experience. Ah it’s good to know you can still have fun solo travelling to Vang Vieng. I’ve always thought you had to go in groups to have fun! We skipped it and went to the Plane of Jars in Phonsovan (this was before the redevelopment too so it had all just closed down at that point.) Great tips! Yeah I love solo travel but I’m always a little nervous if it’s to a place which is normally frequented more by groups. How was Plain of Jars? I wanted to go but just didn’t have the time! Glad you had a good experience! I was there right before the government shut down the old party scene, and it was really a mess. I skipped the tubing for an amazing kayaking trip instead. Sounds like it’s calmed down quite a bit since then! I don’t think I’d have liked it back then even if I would have been younger! The kayaking looked great, I think if I did it again I’d do kayaking instead of tubing! I went tubing in 2011… must have been shortly before they closed it down! I wasn’t keen on the town on Vang Vieng with all of the bars showing endless re-runs of Friends and The Simpson’s. It made me feel uncomfortable. I did enjoy my tubing experience but I’m not much of a partier and so I was much more reserved than most around me! I explored some local caves and enjoyed the scenery, which is beautiful around there. Pleased to hear the focus is much more on that these days. I wasn’t very keen on the town in the evenings either…I went for a bit of a wander but just wasn’t my scene! I really enjoyed my cycle ride out to the caves too! I actually decided to skip this when I was in Laos. And regretted it afterwards when I heard nice stories like this! It was also an age thing for me I guess. I nearly did too, I was really torn but glad I went in the end! Haha, I also felt my age in Vang Vieng! We went tubing, which was a bit more of a sloppy mess than your experience (oy, we all make mistakes! ), but I agree, the best part of Vang Vieng is the stunning nature. The next day we rented a motorbike and zipped around, and I was absolutely floored. Haha, sounds like you had fun! Motorcycling around there would have been good…unfortunately I’m a bit of a wimp when it comes to riding bikes! I miss Vang Vieng! 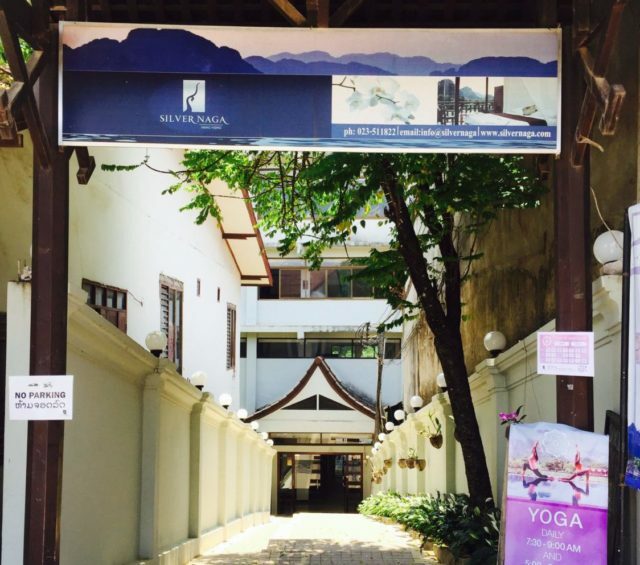 I taught yoga at the Silver Naga for a month last year and the staff are truly friendly and helpful. Did you manage to climb Phangern Mountain or visit the waterfall during your time there? P.S. sounds like you kept up with the 20 somethings – never “too old” to have a good time! Yeah Silver Naga was lovely…I wish I’d have had longer there, unfortunately I only had a day and a half so didn’t make the mountain and waterfall. I did cycle out to blue lagoon but was quite unenamoured by it. On thhe last morning I trekked out to the caves and thought that was pretty good! I try my best to keep up…the mind is always willing and easily persuaded, but I pay for it the next day now! Haha! This still looks like a lot of fun, despite things being tamed down a bit. Which I don’t have an issue with. i’m interested to see how the area develops for adventure tourism! Yes it was Jean, I think 15 years ago (maybe even 10) I’d have loved how it used to be. Howver, now I think the tamer version is much better and less likely to ruin this area of natural beauty. Obviously limiting the tubing has had an impact on local tourism, but it’s such a beautiful spot I think it could really take off as an outdoor adventure and ecotourism destination.